Well, these cute kittens definitely get an "A" for effort when it comes to playing with their new toy. They know there's a ball in there, and that they're supposed to be able to play with it... but how? A little purrseverance, though, and they finally get it! How about kittens and toilet paper, please. Oh, how Cute loves munchkin cats! With their squatty little legs and their chubby little chubbies... and the fact that they have this tendency (talent, in my opinion) to stand on their back legs! Beibei the munchkin cat is an excellent stander-upper! And when he starts to do a little walk too. Swoooon. Too much cute. Enjoy! 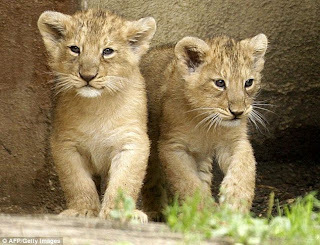 Two cute baby lions were born at the London Zoo 10 weeks ago -- and they just took their first little lion steps yesterday! 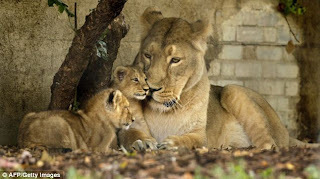 The two baby lions are a boy and a girl and don't have names yet. Maybe we could suggest some? 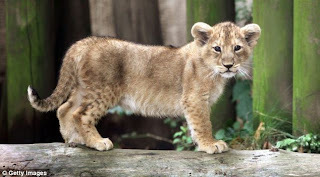 I'd love to name a baby lion! 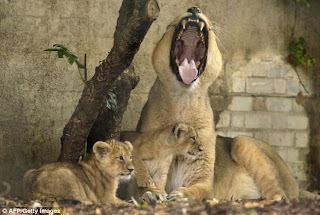 *Baby lion story and images from the Daily Mail. Earlier this morning, Cute put up a DJ turntable kitty spinning on the ones and twos... now we have a boxing cat giving him the ol' one-two punch! Fierce, no? I wouldn't want to be the person to face this kitty in the morning when he's hungry! *Thanks to Cute's friend Kerri for sharing this cute boxing cat video! Luk Chai the baby elephant (he lives at the Taronga Zoo in Sydney) doesn't need a rubber duckie to make bath time lots of fun -- it's fun just to splash around and look cute. Wait for it while you're watching... it gets even cuter when they start spraying him down with the hose!